Here is a photo of the very first airplane Chad and I have taken together. We had a very long day of traveling and are now at the hotel in Seattle. Tomorrow morning we get up and take the ferry to Friday Harbor. It's going to be so nice to relax. Hopefully we'll do that a bit ... More posts to come, hopefully. As many of you know, Chad and I will be going on our first real vacation together starting tomorrow. We leave in the morning for Seattle and Friday Harbor (on San Juan Island off the coast of Washington). We'll be away from tomorrow through July 10th so I have no idea if I will have internet access. I'll keep taking photos every day (of course!) but may not post them until later in the week. Here is our suitcase. I think it's packed pretty well. We're trying to travel light, but ... you know, it's kind of hard to know what we'll need. Haha. Look for some fun photos from me when I next get a chance to post! Today I was at the NJDEP again for almost the whole day. 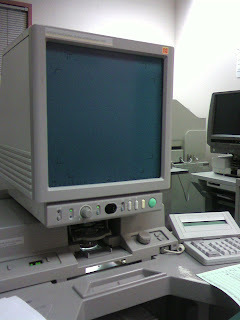 I spent some time in their Microfilm department going through documents on this funky machine. It was actually pretty cool. You could hit a button and it would print the screen for you. You could have it start printing and print every page until you hit stop, but it was SOO slow. I took this photo with my cell phone! I think this is the first cell phone photo I've posted. I took it using my new Samsung sch-u740. Great phone so far. The Bee Balm Chad planted have started to bloom. Actually, only one of them has. The flowers are pretty nice. I don't think we've been taking as good care of them as we should. They like being very moist but we rarely water them. Oops. On my way to work today I noticed this tree with little puffy blossoms. They were so awesome and I had never noticed them before. It is right before I make my turn off of Route 73. I noticed today because it was a bit backed up due to a tractor trailer that was sitting in the turn lane not moving. This photo didn't come out as nicely as I hoped but hopefully you can see how they just look like little puffs of pink and white. Anyone know what kind of tree this is? I had to do a file review at the New Jersey Department of Environmental Protection today. Their offices are in Trenton so I drove up there this morning. Right up the street from the parking garage was this awesome church. Why is it that so many churches are so cool-looking? I've always thought it might be neat to convert an old church into a home. The file review was super boring and I have to go back on Thursday to do more, but the files on Thursday should be a lot more interesting (I hope). We had pizza from the new Peace-A-Pizza on Old York Road tonight and we played SingStar. This is the four cheese white pizza that is my favorite. Yummm. Deb and Bud are so sweet. They brought us this gift today, an Asparagus Fern, as a thank you for helping them with the carpet yesterday. We certainly didn't need anything in return because we were just happy to help out, but this is an absolutely beautiful gift. It is even in a really nice pot and it looks like it was made to go in our dining room! Apparently it isn't actually a fern they just call it that. Interesting. You know what is funny about this photo? There is a tissue sitting on the table that I didn't even notice. When I saw it, I thought "Oh man, I'll have to take another picture." Then I realized that this is absolutely perfect because I have a cold, so this tissue symbolizes the fact that I was blowing my nose all day long!! At least my throat doesn't hurt that much anymore. We stopped by the library so Chad could check for a book but they weren't open even though they were having an event. While I waited in the car, I could see this Korean church across the street, and it just reminded me of some Buddhist monastery up on a hill or something. The steps leading up to the door and all that. I thought it was neat and I had never noticed it from that angle before. Some of you have already heard, but our neighbor, Bud, recently had a cycling accident during a race. He was pretty beat up and needs surgery for his shoulder. Deb is working hard to take care of him, but I know it is difficult for both of them since he has to be so careful. So Chad and I made dinner to take over to them tonight so they wouldn't have to worry about what to eat. We made Chinese Chicken Salad from Ina Garten. Very tasty stuff. Hopefully Bud has a speedy recovery! 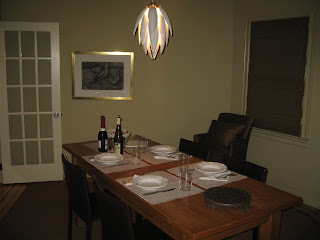 Here is a photo of their dining room with their awesome new chandelier. Their house is beautiful. Here is a photo of how our grass currently looks. This is new grass (within the past couple months). It grew so quickly and so well, I hope it lasts. This photo is for Adina so she can see how lovely it is. Please ignore the recycling bin on the porch, today was recycling day. The grass is a Shade Mix from our local garden center. It has some rye and fescue and I'm not sure what else. Inspired by Erin's Karaoke game (she got it for Christmas from Matt), I went searching for my own. What I found was that I could buy them on EBay for a reasonable price. I ended up going with Singstar instead of Karaoke Revolution because it had so many more songs that I actually knew. The song list on this one is pretty good. Click here for a track listing. It arrived today and it was so exciting. It came with 2 microphones! Isn't that awesome? Am I a super dork or what? I'll have to play alone for a while because Chad won't play with me. Chad and I had a lovely day of shopping and seeing my family. We went to King of Prussia Mall where I went to the Apple Store for a workshop on Garage Band. Very cool. I'm inspired to make some cool tracks. Then we went to Ikea and bought the desk we've been craving! Here is a photo of it all set up in our library with a wonderful chair as well. It's so exciting. We didn't think it would fit in my car, but miraculously, it fit with very little effort. Plus, I was worried that they didn't carry the desk anymore because it doesn't show up on the website, so I was so relieved that they had it. Today was a great day. We had cake and ice cream with my family to celebrate Nannie's birthday and Father's Day. Fun fun. Here is my recipe for June. You can find the recipe here. It was delicious, just like Adina and Steph said. Grilled tandoori style chicken with mango jasmine rice. Some of the marinade for the chicken goes into the rice while it is cooking and makes it so fragrant and delicious. I really love cooking. Too bad I don't have more time for it (although I will over the summer since I don't have any classes, yay!). I got a wireless mouse and work and I'm loving it. It's a little too small for my hand but I'm getting use to it. 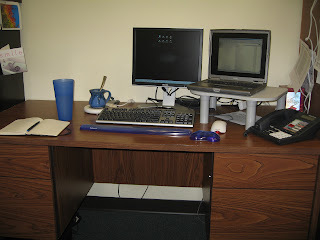 It is so nice not to have the clutter of cords all over my desk. Actually, I just have one cord fewer now but it's a start. Haha. Look at all this loot! My parents brought back all these great gifts from Japan for Chad and me. It was really exciting. There are little notebooks and pens, plus a variety of items from Muji like desktop pencil holders and even placemats. We really miss Japan! Chad bought me this Mickey Mouse tie when he was down in Florida a few weeks ago. Isn't it nice? I wore it today for the first time. Only a couple people commented on it and actually noticed that it was Mickey. It's very tasteful. They may be coming to a town near you and I would love if you could support them in any way you can. We met with Judy, the owner of the White Dog Cafe and she gave us a very inspirational talk! I got home pretty late though ... time for bed. Each person in our office has a different way of dealing with the cold. 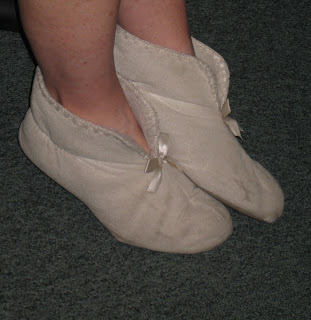 Heather and I cover our vent and keep our door closed, while our neighbor, Claire, wears these lovely slippers! It actually wasn't too bad today but Claire wore open-toed shoes and her feet were chilly so she switched to the slippers. The best part was that they matched her outfit perfectly! Chad and I went and checked out the Gay Pride Parade in Philly today. We actually waited for the parade at the end of it, which meant that most of the people dissipated before they reached us. This was one of the few floats we saw and probably the most interesting. I'm not quite sure what they were promoting, maybe a nightclub. Guys with wings is always fun though I guess. We hung out at the festival they were having but it ended up being really hot in the sun and it was kind of boring because we didn't know anyone else there and so we just left. But we had a fun day anyway (we ended up hanging out with a coworker of mine). We finally planted our witch hazel tree today. When I say we, I mean mostly Chad. It is now safely in the ground with mulch around it. We can't wait for it to grow up to a mature tree. It might take a few years before it starts blooming but when it does, it will be amazing! Can't wait. I was so proud of myself today because I cleared off my desk completely of papers and reports and all that nonsense. I also rearranged my desk yesterday to make it work a little better for me. I based it on the way Heather has hers laid out. I don't know why I did it the other way for so long (my laptop and external monitor were switched). This way is so much better! We got strawberries in our CSA last week (and this week too). They are a bit sour, but some sugar fixes that! What I love about them is that a lot of them still have stems on them, some long and some short. It really makes it feel more personal. Would you ever get a strawberry looking like this at the store? Probably not! Yum. Don't ask me why this isn't centered on the placemat ... I wasn't even thinking of it until now! Anyway, we had some Ramen for dinner tonight! Woohoo! We got it at Han Ah Reum. Chad made it for me (along with some marinated tender spicy pork from Han Ah Reum). The flavor is Shio-ramen and Chad put scallions and corn in it. Yum yum! I miss Japan and my silly parents are there without me! I hope they enjoy some ramen like this (only better) while they are there! Ninniku-ramen is my favorite (from Kichijoji). I love popcorn, but it's really hard to take a picture of it. The flash makes it look like one large neon mess, and there isn't enough light to get one without flash that isn't blurry. This was my best try. Chad decided to have popcorn as a snack tonight and it smells so good. I'm going to go steal some now! Chad was being bad today, so I put him in a cage. Haha. Sorry I didn't post a photo yesterday (I did at least TAKE a photo yesterday). I was studying for tomorrow's final exam and my eyes kept getting heavy and I kept nodding off for a few seconds. I finally couldn't take it anymore and just went to sleep ... at 9 PM! This is unheard of for me on a Saturday and I'm not sure what came over me. I thought that I might just take a short nap for a bit but then I ended up sleeping all the way until this morning at about 8:30. Anyway, this photo shows a bunch of broken up concrete. We were woken up yesterday morning at 8:30 to the sound of a jack hammer breaking up a neighbor's sidewalk. This continued through most of the day. What fun. Chad and I saw a pathetic baseball game tonight. My parents gave us tickets because they are leaving early tomorrow morning for Tokyo and didn't want to be out late tonight. The Phillies were up against the Giants (with Barry Bonds) and lost 13 to ZERO. It was absolutely pathetic! The Giants' pitcher got at least 3 hits (we left early) which is almost unheard of in baseball. One of the hits was a double! Anyway, it was pretty sad but still enjoyable, especially because the seats are fantastic (as you can probably tell from the photo). There was a guy sitting next to me who was incredibly obnoxious, screaming and cursing and flailing all over the place. Quite annoying, but I was a little scared to say anything, you know what I mean?